LAWRENCE — Even though Latina/os are now the largest “minority” group in Kansas and in the United States, they often struggle to make their voices and identities known. 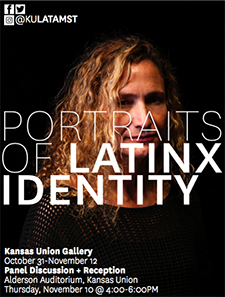 The KU Center for Latin American & Caribbean Studies, CLACS, in collaboration with the KU Hispanic American Leadership Organization, HALO, will explore those issues with the exhibition “Portraits of Latinx Identity” and related campus events. CLACS and HALO believe that visibility is essential to cultivate community, create a sense of inclusiveness and move beyond stereotypes. By displaying portraits of individuals in the campus community who identify as Latino, Latina, Latin@ and Latinx, the project intends to showcase the diversity of the community. The term “Latinx” is relatively new and evidence of the community’s commitment to be conscientious and inclusive. As with any change, the term is not without controversy, inspiring a healthy debate among community members and scholars about the gendering of language, the need for gender-inclusive terminology and the importance of tradition. Caminero-Santangelo will also participate in the panel discussion in connection with the exhibition. The portraits, taken by Chris Ortiz, featured hard light against a black background so as to focus on the individuals and inspire empathy in viewers. Born and raised in Lawrence, he received a bachelor's degree in art history from Baker University and is currently working on his master's degree in photography from the Savannah College of Art and Design. “Portraits of Latinx Identity” is open through Nov. 12 in the Kansas Union Gallery, located on the fourth floor of the Kansas Memorial Union. The gallery’s hours are 9 a.m.-5 p.m. Monday-Friday. A panel discussion at 4 p.m. Nov. 10 in Alderson Auditorium featuring faculty, staff and students who will discuss their personal identity, the history and meaning of various terms, such as “Latino” and “Hispanic,” the importance of self-identification and the power of subversion. A public reception with light refreshments following the panel discussion, beginning at 5 p.m in the Kansas Union Gallery. Additional sponsorship and support come from the Office of the Provost for Academic Affairs, the College of Liberal Arts and Sciences Office of Diversity, Equity & Inclusion, the Department of American Studies, the Office of Multicultural Affairs and Latin American Graduate Organization. The programming follows a spring 2016 series, “Latino Americans: 500 Years of History,” made possible by a grant from the National Endowment for the Humanities and the American Libraries Association.